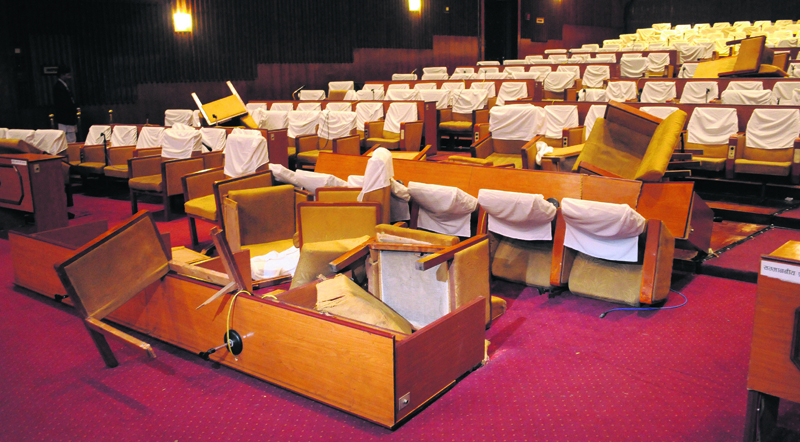 This January 20, 2015 photo shows broken furniture at the Constitution Assembly (CA) after Maoist lawmakers resorted to vandalism the earlier night. The Maoists were angry after the speaker allowed Nepali Congress chief whip to table a disputed proposal. The property loss was estimated at Rs 3 million. KATHMANDU, Jan 18: A midnight meeting of the Constituent Assembly on January 19, 2015 witnessed a fierce scuffle, with lawmakers mainly from the then UCPN (Maoist) brawling with the marshals and vandalizing the chairs, tables and microphones. The lawmakers of what is now the CPN (Maoist Center) were venting their ire when Constituent Assembly (CA) Chairman Subas Nembang asked NC Chief Whip Chinkaji Shrestha to table a proposal at the meeting amid strong objections by the Maoist-led 19-party opposition alliance. Although details of the incident were never publicized, it was estimated that the vandalism caused property loss amounting to around Rs 3 million. 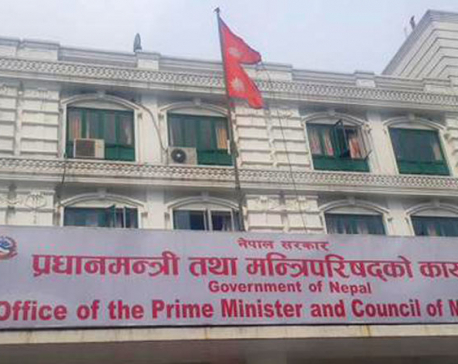 Following the incident, CA Chairman Nembang formed a five-member committee led by General Secretary of the Parliament Secretariat Manohar Bhattarai to identify the culprits, compile details of the loss in physical property in the CA hall, and recommend punishment for those involved in the incident. Rule 46 of the CA/parliament regulations included a provision for suspending for 10 days lawmakers involved in such activities, and recovering compensation from them. Wednesday marks two years since the incident took place, but the report of the probe committee has not been made public so far, let alone punishing the vandals. “The committee submitted its report, but I didn't make it public as punishing the lawmakers involved in the brawl could vitiate the political environment,” then CA chairman Nembang told Republica on Tuesday. Nembang said he had consulted top leaders of the major political parties before shelving his plans to publicize the report and taking action against those involved in the vandalism. “The main complication was that we were then on the verge of promulgating a new constitution,” he further said. Following the incident, the CA missed its self-imposed deadline of promulgating the new constitution by January 22, 2015. 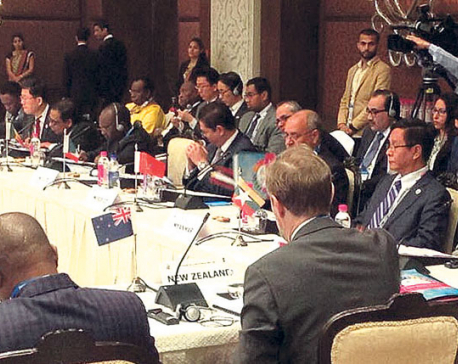 The ruling parties decided to halt the process. A few months after the incident, the devastating earthquake in April helped bring the agitating Maoists on board the new constitution. The CA transformed into a regular parliament after promulgating the constitution on September 20, 2015. But the lawmakers involved in the brawl and vandalization have never faced any charges and any hopes that the guilty would be booked faded after the House got a new speaker, who is from the Maoist party. According to a member of the probe committee, seven Maoist lawmakers were indentified as responsible in the incident. The source further claimed that Umesh Kumar Yadav, Daljeet Sripali, Shiva Kumar Mandal, Janardan Sharma, Aman Lal Modi and Dil Bahadur Nepali, among others, were also found to be responsible. Except Nepali, all were from the Maoist party. Interestingly, three of them have been appointed ministers in the government. Yadav was appointed Minister of Irrigation when the Maoist party joined the government after the promulgation of the new constitution. When the Maoists formed their own coalition government in August, Sripali and Sharma were appointment Minister for Youth and Sports and Minister for Energy respectively.